In 2001, this regional manufacturer of industrial cable systems began advertising to architects and builders. None of the many competitors appeared to be the market leader, but Feeney’s small-space ads and industrial–looking catalogs promised a little company and an uninspiring product. 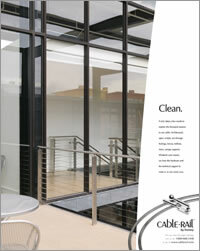 We redid the catalogs to show how Cable·Rail understood the needs of the design community. We broke out the campaign into minimum–space ads for low–cost response and full–page branding ads directed to each of their important markets. No longer a faceless maker of commodity hardware, Cable·Rail is now the one company in its field that speaks the language of the design community. The ads broke in June, 2003, and in less than a year, architectural orders were up 10%. Feeney is breaking ground on a factory expansion. © 2007 The Hayes Company. All Rights Reserved.